This time of year, I could throw a rock in any direction and hit someone who is having a birthday. I guess it makes sense. Nine months ago were the sultry summer months filled with scantly clad youths, strutting their hormones. Now, we have a busy spring filled with babies of all ages, I being one of them. An essential ingredient to a successful birthday is the cake. Be it chocolate, vanilla or carrot, the cake is the true emissary, heralding the arrival of yet another year. (Which seems to be speeding up at alarming rates!) One of the best gifts to give a loved one is a home made birthday cake baked with love. Now, birthday cakes don’t have to be loaded with fat to be magnificent. In fact I think a cake made with less fat and calories is so much better. I have experimented over the years with a different yellow cake recipes and this one is by far the best. It has about half the calories of a regular yellow cake. The flavor, texture and moistness are absolutely perfect. I think you will be completely knocked over by the frosting as well, with half the fat. Happy Birthday everyone! To start making the birthday magic, get out your favorite cake pans and lightly spray them with cooking spray. I personally love my spring form pans. If you aren’t using a spring form pan, then lightly dust them with a tiny bit of flour on the bottom. Preheat the oven to 350 degrees. In a lovely bowl, mix the butter and sour cream together till creamy. Add the sugar and vanilla and mix with a mixer on medium speed for about 2 -5 minutes. (Depending how much you are into this!) Add the eggs one at a time, and mix well till you have sunshine in a bowl. In a different bowl, put the flour, baking soda, powder and salt, stirring well with a whisk. Add the dry mix to the wet mix, about a half of cup at a time, alternating with ¼ cup of the buttermilk, till the batter is just blended together well. Don’t over mix at this point or you will have interesting bumps in your cake tops. Pour the batter into the cake pans and tap them a few times on the counter to coax the air bubbles out. Tuck them in the oven on the middle rack for about 30 minutes till a toothpick comes out clean. (I usually can tell when the cake is done by gently touching the middle of the cake. If it feels set up, it is done.) Cool them on a cake rack for about 10 minutes then remove them for the pan. Let them nap on the cooling rack to get ready for their birthday dress of frosting. Plop the cream cheese in a mixing bowl and drizzle the butter over it. Beat with your mixer at a high speed till fluffy and inviting. Here’s the tricky part, sprinkle in the cocoa powder, then the milk, over the creamy mix and blend on LOW till the cocoa powder is safely mixed in. Beat faster till well blended. Add the powdered sugar, one cup at a time, with the blender on low again. After two cups of powdered sugar, taste it and see what you think. I like it at this sweetness, but you may like more sugar. When you have it at the perfect sweetness, whip it up good with the blender till you can’t stand it any more, and you have to lick the beaters! Frost your cake or whatever you have in mind and enjoy! This looks great! I’m soon looking down the barrel of another birthday, and am celebrating getting older with a diet, and need a “healthy” cake. 🙂 But … how big are you spring-form pans? Does this really make enough batter to fill three of them? Thanks! I have these cute little pans my mom found me a long time ago. So I would say they are about 8 inches in diameter. 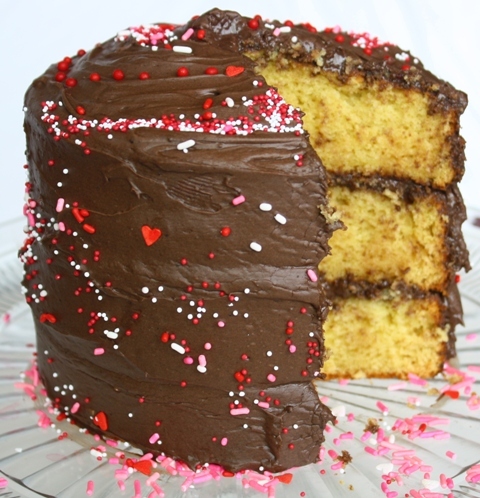 The batter would make two nice plump regular cake layers from normal spring form pans. You could easily cut them in half to make a 4 layer cake. Happy Birthday! That is a great looking cake! I really want to try chocolate frosting with cream cheese! Ohhh wow this cake looks amazing, yummm! Even better since its “healthier” hehe ;). Does it taste low fat? I hate skimping on things I really love if it’s going to compromise the taste. I would rather eat the full fat version of something if I know it’s gonna taste better. No worries there! This cake tastes better than the full fat version, I think. Enjoy! I tried it and it does taste better and what’s more you don’t have to have a piddly little bit cos of all the fat, you can have a normal sized portion… wohoo! I have to make a birthday cake here in about a week. I’m delighted you posted this. I’m sure my cake will not look nearly as lovely as yours, but you’ve given me a goal! This looks great! Can’t wait to try it. I just want to make sure I understand the number of cake pans to use. Above you state two, but the photo shows a 3-layer cake. How many do you recommend? your cake did turn out perfectly! What a lovely and gorgeous cake for birthdays. Thanks for sharing it. Hey, I enjoyed your article it is very informative. I gained 5 pounds just looking at the picture. Keep up the good work. I just found your website via google. I am the co-owner of several high-quality related sites, and I was wondering if you might be interested in exchanging links? If you’re interested, let me know and I’ll send more information about my sites and some ideas for a possible collaboration. 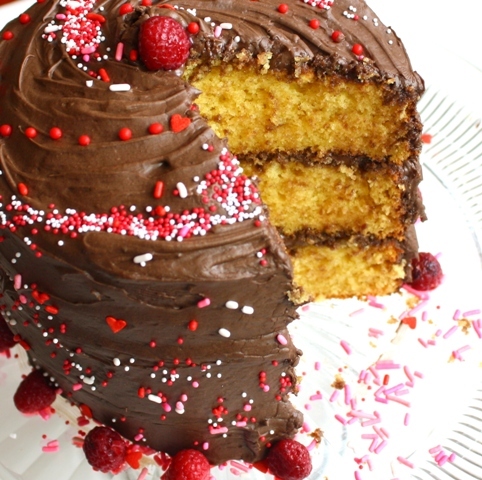 Magic Yellow Birthday Cake | FOODBEAST - Because we're hungry.